I’m a boy mom so all my dreams of shabby chic bedrooms with painted furniture and femininely powerful sayings on wood signs stay exactly right there, in my dreams. I do however have a lot of fun with my boys’ rooms. I am breaking my 2 boys rooms up into two posts, so be sure to check out my other post full of Camp Vibes! My older son had an obsession with outer space when we were converting him from a crib to a bed, so of course, I fed into it. I try not to be overbearing with themes when I do decorate with one. I think it’s fun for a kids room and helps them with imaginary skills. Whenever anything needs to be sent to outer space or if we want to take a trip. We run to the rocket! I am big on reading, I love to read myself and if I do anything right as a mother I hope to instill my love of reading into my kids. They both have reading nooks in their rooms. Well, reading nook / play area / hiding spot. 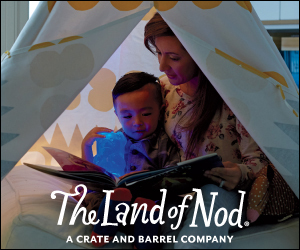 This rocket is from Land of Nod. We purchased this almost 4 years ago now, they no longer have the same one but they do have a similar one. Check it out here. I love antiques, and I was able to come up with some really cool ideas for this guys room using some vintage pieces. In his gallery wall you will find am old bread pan, sometimes it’s filled with superheroes, sometimes it’s not. You will also find an original newspaper article from when Neil Armstrong landed on the moon. I got it framed professionally, which ended up costing more than the article itself. If you do something like this, I would consider your framing options! 😉 The article was cheap, we got it off of Ebay. The “Oh the places you’ll go” sign and the cut out of America are from an Etsy shop called Chalkboard Blue. The letter E and the button are from Hobby Lobby. Ethan picked out the button himself, so of course, I had to incorporate it. I love how of all things, he picked out a button. The rocket and stars actually came on a base and were meant to be on top of a dresser or desk. It ended up breaking because Ethan was always playing with it, so I used putty and stuck it all to the wall. I’m actually quite glad it broke! The car sitting on top of the bread pan is from his Aunt, she spent some time in Africa and brought this home for him. It is handmade. In this corner, we have a metal container from Nasa. My husband found it, go him, right!? It’s a storage container from 1971. I have no idea what it stored, but it’s heavy. The astronaut sign is from Target and the letter E book is from Anthropologie. Wall color is called Bracing Blue by Sherwin Williams. The bedding is all from Land of Nod. Unfortunately, I got it all a few years ago now so it’s no longer available but they have some really great options for boy bedding. Click here to be brought directly to the site! Lastly, I want to talk about these books on top of his bookshelf. These have broadened his little mind so much. Again, his Aunt got them for him and they have become a sort of tradition that she will get him a new one for a birthday or holiday. These are from Anthropologie, I highly recommend them! The pictures are entertaining, and the books are so educational but fun. I learn something myself every time we open one of them. Well, that sums up this room. I hope you enjoyed the little tour of Ethan’s Outer Space Bedroom. As always, if you have any questions or if I didn’t mention where something is from feel free to reach out and ask! Click here to take a camping trip with Reid!